Two "refugees" burned down their own asylum center by throwing burning charcoal they used to smoke a hookah in the trash. Police initially suspected "xenophobes" were responsible for the crime after the migrants lied to cover-up their idiocy. The fire in a refugee camp in Upper Franconia Gößweinstein after investigations by the police were apparently caused by two applicants. The 18 and 20 year old men had disposed of glowing charcoal a hookah improperly shared with police and prosecutors on Sunday evening. The two men were taken on suspicion of negligent arson in custody. 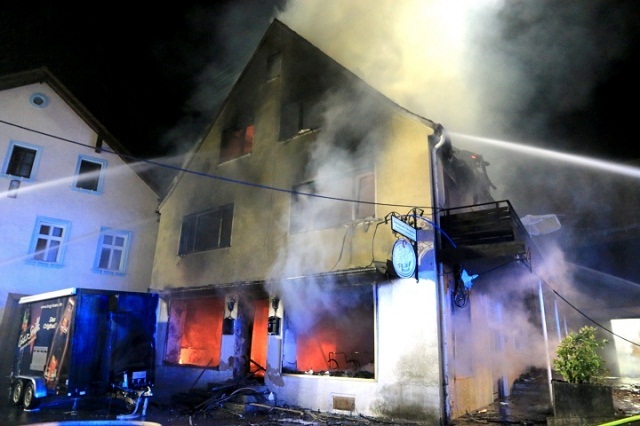 The fire in the former restaurant in Gößweinstein (Forchheim district) in the early hours of Saturday, a damage of around was 100 000. Euro emerged. The eight residents of the property were able to save time into the open, was injured nobody. First findings of the fire, according to investigators, the fire broke out in a storage room on the ground floor. Investigators are the two alleged perpetrators managed to track down because they had made contradictory statements after the fire. Against both men were issued arrest warrants. Nordbayern reported the center was housing a Somali woman and her son along with an "extended family" of Syrians. While this arson was the result of stupidity, other migrants have set fire to their own asylum centers to frame far-right "neo-Nazis," and others have done the same to demand for "better housing."